I want to be the antithesis of the the stuffy Sommelier, it is just fermented grape juice! As a chemist, I've always been intrigued wine and the process of winemaking. Yet I was on the on the track to becoming a working Engineer. Three years ago after bantering with a Master Sommelier that I now call a friend, I decided to see if I could make my passion a career. He made me realize tasting was not subjective but a deductive process. That catered to the scientist in me and I have not looked back. Wendy Shoemaker is truly a renaissance woman. As an avid traveler with a keen sense of adventure and a love of food & culture, it is no surprise that her introduction to fine wine happened during a trip to wine drenched Italy. A friend told her to find a bottle of 1995 Brunello di Montalcino to taste. Once she found one she was hooked. This --her first bite by the wine bug-- has left her addicted ever since! She is now a wine-passionate Sommelier who just took the rigorous Advanced Exam in in July and passed! Her sights are set beyond that towards the coveted Master Sommelier Diploma. As if this wasn’t enough, she also earned degrees in both Chemistry and Biochemistry, and a Masters degree in Mechanical Engineering focusing on solar energy while simultaneously earning her Sommelier Certification. She has found the rich history surrounding wine as fascinatingly captivating as their aromas and flavors. Sharing these with others has become her passion. Having spent 14 years working for the Disneyland Resort, last year she joined the Marina Kitchen at the Marriott Marquis in San Diego as their Wine Director. 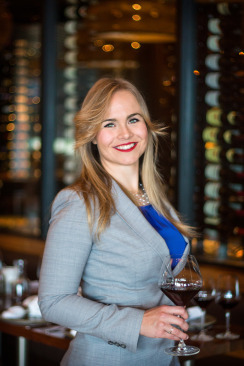 She was a recipient of the Guild of Sommeliers “Napa Valley Enrichment Scholarship” and is on the Board of Advisors for SommCon.